For this particular model, it is not just about essentials and basics. It is all about perfectionism. Before we proceed to tell you what exactly is encompassed in this unit, let us first inform you why you should choose no other model apart from this one. Purchasing this product is never a gamble because you are entitled to product warranty of one year. This warranty period allows you to use your product without worries over its breakdown or failure in functionality. You can also register for a warranty of 3 years upon purchase and still get it. This means that any problem arising from the product manufacture won’t present an obstacle to you in case it occurs. If this occurs within one year of purchase, you have every reason to claim back your money. 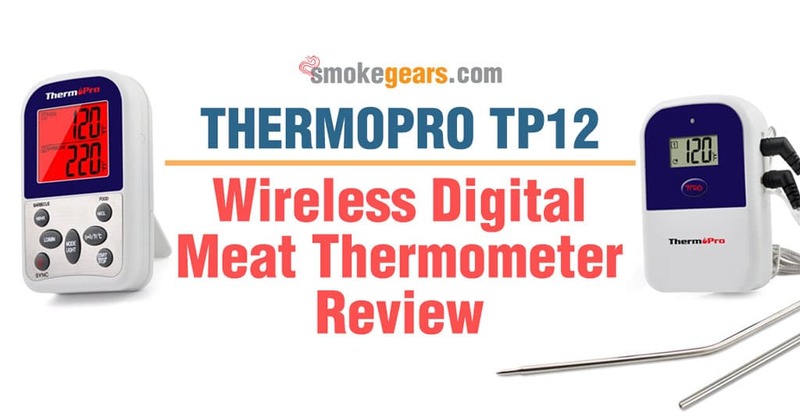 ThermoPro wireless meat thermometer comes with all the essential features such as dual probe and 300 feet remote control range. These, among other features, are what you are certainly looking for in a probe thermometer. Because they have been covered by ThermoPro, we confidently recommend it for your perfect grilling. The probe wire can withstand up to 716 degrees Fahrenheit. This allows you to carry out multiple types of food preparation activities without the limitation of temperature setting. Whether you are using an electric smoker, oven or simply your BBQ, you have no issues with temperature regulation. ThermoPro smoker thermometer is perfect for temperature recording due to step-down design featured by the 6.5” and 3” probe. Simply insert your probe into the deepest part of your meat and wait for the results. You can stroll around and have the fun with your surrounding as your food gets ready. Wide temperature range and accuracy makes every type of your cooking accurate. This feature allows you to smoke turkey and other types of meat and game meat with no worries at all. Lastly, alarm and timer, receiver, and flash are other essential elements that make your cooking process a heaven of joy. No need to keep watch on your screen. Immediately, your food gets ready, you will receive an instant alert accompanied by beeps and flashes. Who is this ThermoPro TP12 Probe Thermometer For? After using this product for a while, we realized that the worth of this product benefits multiple types of users. I am just an enthusiast who likes smoking chicken and turkey. I do it as part of my leisure. But I am so much attached to my TermoPro TP12 probe thermometer that I can’t do without it. If this utensil is beneficial to a mere smoking enthusiast, then as a professional in kitchen activities, you need it even more. You may be working in a busy restaurant and often find yourself multitasking. Similarly, professional chefs have an upper hand in benefiting from the use of ThermoPro equipment. We have in store a great bulk of testimony about the efficiency and functionality of this gadget. The fact that there is a 1-year warranty accorded to this product, it implies its absolute functionality. Upon synchronizing the receiver and the transmitter, your set will be ready for the job. At least 1100 users have tested its service, approved and recommended it positively. Among all these customers, it is logical to buy their suggestions and recommendations. Long term warranty manifests quality service. Can be used for BBQ, Oven, Smoker, Candy, Meat, Food. High quality stainless steel mesh cable. Made of plastic as main material this susceptible to damage. Oven/BBQ probe is shorter than the food grade stainless steel probe. Having reviewed positively and rated highly by a multitude of customers, ThemoPro TP 12 is genuine equipment. It is important to note that the warranty of 1 year assures you of indisputably high quality service. Therefore planning to have exact model like this one is a great way to transform your cooking experience. The above discussed facts and features are reasons enough to prove your decision to buy this probe thermometer. To get this probe thermometer, simply visit a reputable website like Amazon and make an order. In the shortest period of time, you will get it shipped to you. This is a decision for which you will never regret.